I am writing to share this story with as many people as possible for my sister, Davina and her son, my nephew, Anthony. I am Zac and my sister and nephew stared death in the face over the last 3 weeks. Anthony who is 8 years old, honor roll student, plays football, basketball, and overall is probably one of the coolest kids I have been lucky enough to know is being raised by the most dedicated and loving single mother a kid could ask for. New Years Eve Anthony was with his dad in Tucson and seemed to be getting what seemed like a stomach bug. His dad took care of him from that Thursday until that Sunday. Anthony just kept getting worse so his dad brought Anthony home to my sister. The minute that Davina saw Anthony her heart dropped at the sight of how sick he looked. She immediately took Anthony to an Urgent Care, who told her he had a simple stomach bug, needing rest and fluids. Through the night Anthony had such terrible pain that the next morning we (Davina and I) rushed Anthony to the Emergency room at John C Lincoln. They became so worried about Anthony and what appeared on the Cat-Scans that they demanded to have Anthony sent (via ambulance) to a pediatric unit where a specialty pediatric surgeon works. They informed us that this was a race against the clock for a possible rupture of the intestine. Without hesitation they put my sister and nephew into and ambulance and rushed them to Thunderbird Banner Pediatric Intensive Care Unit. Once there Anthony had to undergo multiple tests and endure tubes being shoved into every part of his incredibly pain stricken small 8 year old body. At 3:30am the surgeon came to tell my sister that Anthony was going to need emergency exploratory surgery, that there was no time to spare due to a massive blockage in his intestine and could rip or rupture at any moment. 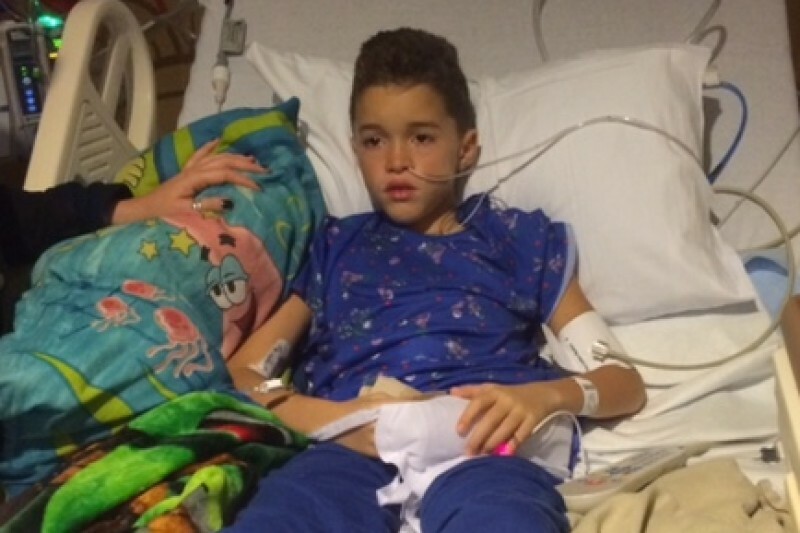 Anthony had a soft ball size blockage in his intestine and a days old appendix rupture. The surgeon could not believe that he was alive and survived this long without worse problems or even death. They had to take out his intestines and clean them out, removing the blockage manually and cleaning away all the bacteria from the ruptured appendix. Leaving Anthony with a cut down the center of his tummy, a lot of pain and not able to eat for 7-10 days. Anthony and my sister are still currently in the hospital nursing Anthony back to health. They are currently reintroducing fluids and foods to his body. Anthony’s father originally covered Ant’s health insurance and my sister covered Ant’s dental. Anthony’s dad stopped covering health insurance due to a loss of his job. Davina cannot add Anthony to her health insurance because her teacher’s insurance is only able to add dependents at specific times (open enrollment). She works as a teacher in Phoenix helping and supporting underprivileged kids and is a terrific mom providing to her son every day. Davina makes sure Anthony always comes first. Now Anthony and Davina are looking at a huge medical expense. She has tried all options for assistance and cannot qualify because she makes to much money for AHCCS to approve them (Remember she is a teacher!). A teacher who won teacher of the year (Teacher of Excellence Award) has to struggle to try and somehow cover the expenses of a lifesaving procedures for her son. To top all of this off she has now been asked to move because the owner is selling the condo. I am seriously calling on everyone that sees this to Please help in any way possible. Help us change the tides of these life altering events that Davina is battling right now. My sister is known by many of her friends, co-workers, family and parents of her students as a superwoman. She cares more than anyone I know, giving all of her time to help others in need, volunteering, donating and going over and beyond any expectations. Her son is her pride and joy, anyone who meets Anthony falls in love with him. He is being raised by a mother who puts him first and it shows in his schooling, social life and his overall happiness as a child. I want nothing more than to be able to wipe this burden away from them. It was already so terrifying and the last thing they need is this large debit to deal with. I will be so thankful and grateful for any donation that is made to help. You would be helping a very deserving person though a very difficult time. from a very worried uncle/brother. I wanted to take a moment to thank everyone for all of your continued help and support! I personally am so grateful and appreciative of everyone for sharing and supporting this fund to help us. This was the most scary thing I have ever gone through in my life. Nothing is worse than watching your child go though so much and come so close to death. It is such a overwhelming feeling to have all of your love and help though this incredibly terrifying time. I want to say a big thank you and please just continue to share if you get a moment in your day! LOVE YOU ALL!!!! PS. Anthony LOVES everyone and says, THANK YOU!!! !